Far-right extremism in Europe is a major cause for concern, especially as extremist groups have started using violence to back up their racist rhetoric targeting immigrants, Muslims and other minority groups. A knife attack at a book presentation event in a city library in Jyväskylä in central Finland on 30 January 2013 reveals that far-right extremists in the Nordic country have become violent and pose a deadly threat to minority groups and Finns of goodwill who promote multiculturalism and those who stand up against far-right extremism. According to a Finnish Security Intelligence Service (SUPO) research there is evidence to show extremist groups in Finland have an "ideological preparedness" to commit violence. [Source] The research indicates that the country should be prepared to deal with terrorist attacks of the kind carried out by Norwegian far-right terrorist and mass murderer Anders Behring Breivik. According to the researcher far-right extremist groups in Finland have so far remained within the law. But the Jyväskylä attack indicates the contrary: Finland's far-right extremist groups operate outside the law. In my opinion, the knifing at the event was designed to disrupt the book presentation and the goal of the "patriots" far-right affiliates involved was to terrorize authors of the book and their audience. It was a violent attack on freedom of expression and freedom of association, and an attempt to silence critics of right-wing extremism. 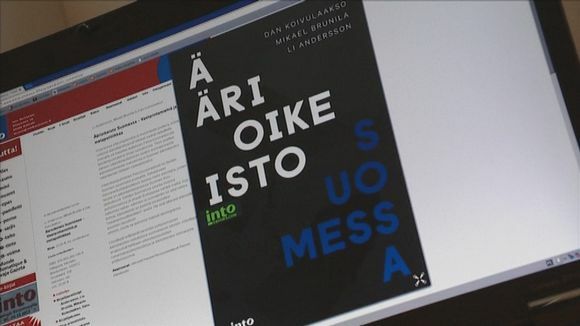 According to authors of Äärioikeisto Suomessa, radical views and racist remarks are becoming more acceptable and mainstream in Finnish public debate. [Source] I agree with the authors. Racist anti-immigration statements - even by public officials - are common and enough Finns and people in power don't condemn such remarks. A case in point is a racist remark by Perussuomalaiset MP Teuvo Hakkarainen in a video interview on his first day in parliament. He used the Finnish word neekeri (the n-word) to describe people of African descent. Recent widely read and criticized writings by people like Pakistani-born Umayya Abu-Hanna and Somali-born Wali Hashi reveal that the use of the offensive and derogatory n-word is widespread in Finnish everyday life. Police declined to investigate MP Hakkarainen's foreigner comments at the request of the Ombudsman for Minorities. Racists have been given a blank check. From the point of view of a researcher at the University of Eastern Finland, the Jyväskylä knife attack is no surprise given the recent political developments in Finland and Europe. Police chief Tuomas Portankorva isn't also surprised by the incident. I was surprised to learn that the Minister of Interior, Päivi Räsänen, doesn't see the far-right as a strong threat in Finland. In my view, the authorities downplay the threat in a bid to keep the public calm. But people deserve to know the truth. Right-wing extremism poses a real deadly threat to Finnish democracy and freedoms as proponents of neo-Nazi views seek to terrorize minority groups and silence critics. The cowardly attack in Jyväskylä city library is an indication that far-right extremists in Finland are violent and if given the chance could commit terrorist attacks of the kind committed by Anders Breivik in Norway. The authorities should not overlook the incident simply because only one person was injured. Perpetrators should bear the full weight of the law. Finland should take concrete steps to ensure that far-right extremists who, like Breivik, strongly oppose multiculturalism don't go down the same road like the Norwegian mass murderer. Unlike Norway, Finland has had warning signs. In February 2012, a gunman opened fired in a pizzeria in northern Finland killing an immigrant of Moroccan origin. Forewarned is forearmed. *Photo of book on Finnish far-right: Yle.